With today's high component pin density coupled with the desire for smaller boards, the need for sophisticated PCB design software is now greater than ever. Printed circuit boards now frequently require the use of blind and buried via hole techniques and multiple power plane layers. Choosing the correct PCB design software requires matching available budget and technical requirements to the features available on the many packages in the marketplace. XL Designer is a versatile PCB layout design system which is simple to use, yet can handle the largest boards that are likely to be put into production. Developed in the UK by the software division of Seetrax CAE, we have always worked closely with design bureaus and board manufacturers to bring you the facilities you need in a PCB design software package. 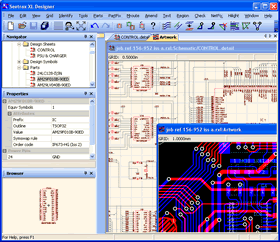 XL Designer is the latest in our line of PCB design software solutions which started 25 years ago with the very successful Seetrax Ranger 1 product. Although our PCB CAD products have been through many transformations over those years, our current product can still load and edit designs created on the original Ranger 1 systems and subsequent products. Why not try out our PCB CAD software for free by downloading the 'Lite' version or XL Designer. No matter how hard we try to get things right, software can sometimes let us down, either through user misunderstanding, or a design fault with the software. And when that happens whilst designing a printed circuit board within a strict timescale, it can be a major problem. For that reason, Seetrax CAE offer a telephone support service to assist customers who encounter difficulties with our software. Most problems can be overcome during a telephone conversation, but with more difficult problems, we will pass problematic customer design files to the software development team for analysis. In most cases, a workaround or updated software version is produced within a few days of the original problem report. Product updates are release regularly, and are freely available to customers during the first 12 months after their initial software license purchase. After that time, updates remain available to customers who purchase optional support cover.